Crystal Visionary, Wizard, High Priest and Yoga Coach. Tristen Churn discovered his Clairvoyant ability at a very young tender age but due to fear, shut that gift down which proved to be a life's lesson well learnt. Two decades later he bravely re-activated his Clairvoyant ability and went even further into developing other abilities: Clairsentience, Clairaudience and Claircognizance and soon enough began offering his healing services to the general public. Tristen's work is inspired by the Divinities and Spiritual Masters such as Judy Satori and Almine, his family members and friends. Tristen connects to his Soul's wisdom on Crystals, Starseed, Yogi and various civilizations as the foundation of his services. 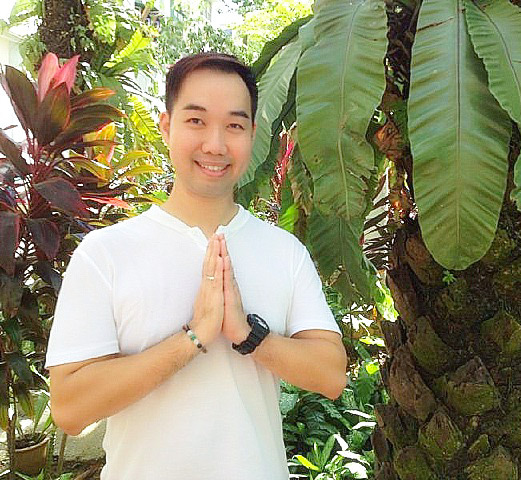 By becoming a multi-dimensional Crystal & Elohim Channeller, Healer and Yoga Coach, he communicates with Crystals, Ascended Masters and Star Beings to bring in love, wisdom and their therapeutic energies for the human race to heal. Spiritually, he chooses to become a Conduit of Lights and Frequencies specializing in Crystal Intelligence since 2008 which involves Crystal Healing, Activation, Attunement and the Advancement of human systems. Since 2008, Tristen’s evolving metaphysical work covers Inner Child Healing, Soul Mate Healing, Maternal & Paternal Emotional Patterns, Karmic Healing, Physical and Spiritual Regenerative Healing, Soul Retrieval, Past Life Healing, Akashic Healing, Multi-Dimensional Light and Sound Healing, Star Systems’ Healing, ceremonies, blessings and more. He provides intuitive energy services in Tarot and Oracle card reading (since 2004), channelling, healing, meditations, workshops of Crystals, Abundance Love and Magic Series. He travels to places such as the different states of Malaysia as well as overseas like China, Hong Kong, Singapore, Taiwan, Thailand and other countries. His sharing is available at website: http://www.tristenchurn.com/ and Facebook page: Tristen Churn – Crystal Visionary & Healer. Timely message shared by the Crystal Kingdom on 21 Dec 2012: The anticipated new dawn of our New Earth. 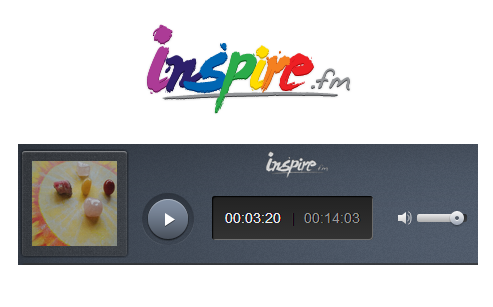 This channeled recording also speak of the future developments of our Fifth dimensional environment in 2013. 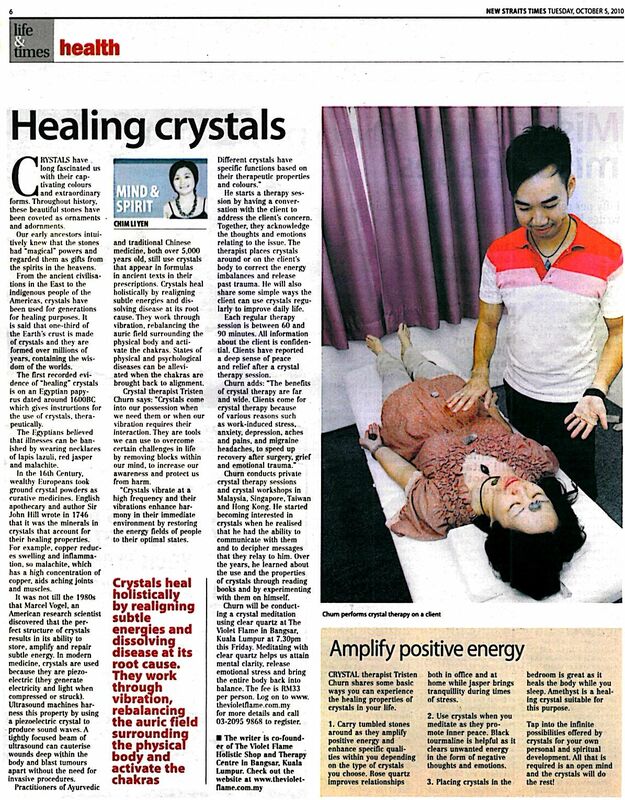 KUALA LUMPUR, 30 Nov 2012: Yoga coach and crystal therapist, Tristen Churn gave The Malaysian Times (TMT) an insightful look into the spiritual and holistic world of healing during Friday Talk Show with TMT. 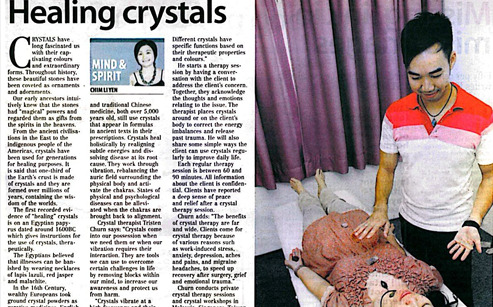 KUALA LUMPUR, 5 Oct 2010: Crystals have long fascinated us with their captivating colours and extraordinary forms. Throughout history these beautiful stones have been coveted as ornaments and adornments.